Pasadena's Julio Jimenez (7) runs down the ball on the sidelines while teammate Hermis Posada (15) and Elsik's Herbeth Calderon (15) and Isaac Nworah give chase. MANVEL – Two goals by Pasadena High senior Jorge Williams in the final 12 minutes of the game provided a final jolt of intensity to the Eagles’ state playoff run on Tuesday night, but it wasn’t enough to prevent a 3-2 victory by Alief Elsik in a Region 3 quarter-final match at Manvel High School. Trailing 3-0 with only a dozen minutes remaining, the Eagles – incredible enough – found themselves taking shots in search of a tie in the final seconds. The reason was Williams, one of Pasadena’s most dependable seniors. With just over 11 minutes left, he scored from close range to break up the shutout. Then -- with just 1:44 left and many of the fans headed for the parking lot – the Eagles blitzed the Rams’ goal again and Williams scored again to cut Elsik’s lead to one. Alas, that’s as far as the comeback carried the Eagles, who finished the season with a 12-6-7 record that included playoff victories over North Shore and Fort Bend Travis. The Rams, considered by many the favorites in Region 3, got on the scoreboard just over 13 minutes into the contest on a goal by Isaac Nworah, the result of a scramble on a corner kick during which Nworah used his chest to deflect a ricochet off the crossbar into the net. Just five minutes into the second half, Elsik made it 2-0 on a goal by Gerald Matus. For the Eagles, the backbreaker was a goal by Steven Argueta with just over 21 minutes to play. Argueta ducked around charging Eagles goalkeeper Diego Pineda and planted the ball in the net. The Rams are 20-2-1 for the season. Pasadena goalkeeper Diego Pineda dives after a wide kick. Elsik's Ali Kromah get sandwiched by the Eagles' Jason Hernandez (3) and Jose Silva (12). Pasadena's Oziel Alcarez (9) and the Rams' Gerald Matus (7) get a leg up in their duel for the ball. 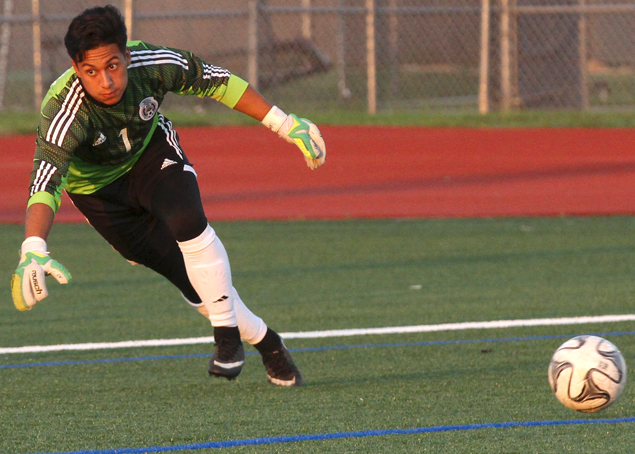 Pasadena's Eduardo Salas battles Elsik's Jose Umana for possession.